STS-123 Pilot Gregory H. Johnson aboard Endeavour in March 2008. Credit: NASA. NASA astronaut Gregory H. Johnson has left the agency, after a 15-year career that included more than 31 days in space, for a position with the Center for the Advancement of Science in Space. A veteran of two space shuttle flights, Johnson served in 2008 as the pilot of STS-123, a mission vital to the construction of the International Space Station. 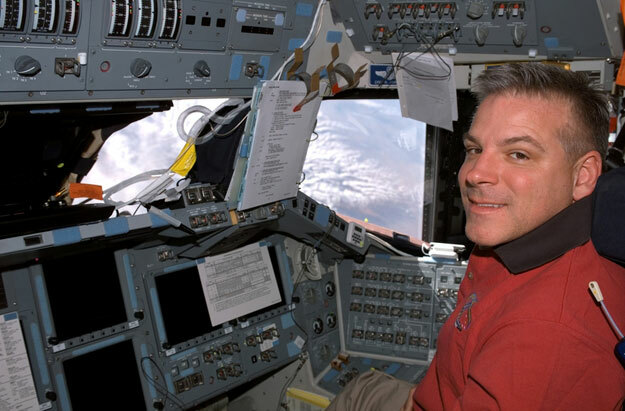 He followed that up two years later as the pilot of STS-134, the penultimate space shuttle mission. "Greg contributed greatly to the construction of the International Space Station, and I very much enjoyed my time in orbit with him," said Bob Behnken, chief of the Astronaut Office at NASA's Johnson Space Center in Houston. "We are grateful for his service to NASA and wish him well in his new career." Johnson earned an undergraduate degree in aeronautical engineering from the U.S. Air Force Academy. He later earned graduate degrees from Columbia University and the University of Texas, and served in the U.S. Air Force as a pilot. Johnson flew combat missions during Operations Desert Storm and Southern Watch. Johnson joined NASA as an astronaut in 1998, and filled many technical roles including capsule communicator for the STS-126, 119, 125 and 127 missions; deputy chief and then chief of the Astronaut Safety Branch; and associate director of external programs at NASA's Glenn Research Center in Cleveland. Johnson recently led the Astronaut Office's Visiting Vehicle Working Group, which helped plan and execute missions with NASA's commercial partners. Johnson retired from the Air Force as a colonel in 2009, after more than 25 years of service. He has logged more than 5,000 flight hours in more than 50 different aircraft.